It feels like spring here in the Carlisle PA area! The calendar may say there are 9 more days until spring but the temperatures are very comfortable for hiking, biking, and exploring the Cumberland Valley! Alas - today is the last day of skiing at Ski Roundtop - but don't worry, the fun continues on the mountain with zip lines, OGO Balls, ropes courses, paint ball, and great food too! The Susquehanna Heartland Wine Trail continues their wine trail specials troughout the month of March. I visited Hunters Valley Winery and sat outside overlooking their vineyard and the Susquehanna River. It was a beautiful day and a beautiful view - and some tasty wine! There are three more weekends to enjoy the special events at the Susquehanna Heartland Wine Trail wineries. Make a reservation for your wine trail getaway. Meadowbrooke Gourds will be featuring bunnies, eggs, and Easter Baskets at their spring open house running through March 24th. You can discover your creative self on Friday & Saturday, March 16 & 17 when you paint your own gourd! 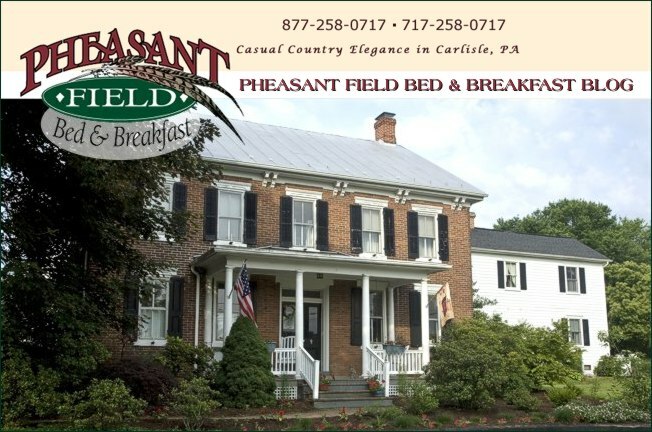 We continue our "winter rates" (10% off) through the month of March so book your room at Pheasant Field B&B for some spring time fun.